YOU can save big on select 2016 and 2017 Honda models! 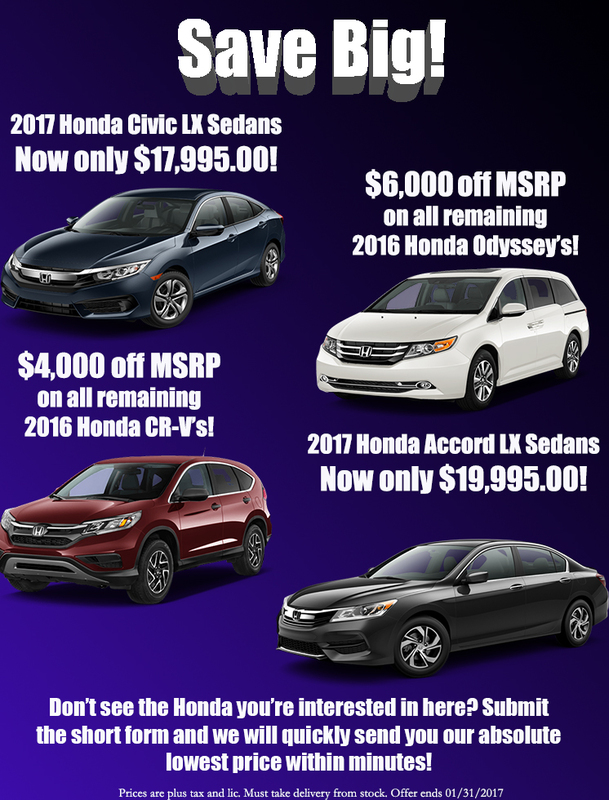 We like to make it easy here at Holmes Honda, and that is why we are kicking off the New Year with these great deals! Save on our 2017 Honda Civic and Accord LX Sedans, and all of our remaining 2016 Honda CR-V’s and Odyssey’s. See below for more details, or if you would like to stop by, we are located at 1331 E. Bert Kouns Industrial Loop in Shreveport, Louisiana. You can also give us a call at 318-212-1200! We look forward to meeting you! For Summerbration Sales Event Specials!